What is Peso Cost Averaging and How does it Work? What is Peso Cost Averaging and how does it work for investments? I’m sure you always read or hear about PCA but you’re wondering how it works, how it makes money, why it’s important, why lots of investors are applying it on their investments and why you should too. Peso Cost Averaging is a time-tested (well-proven) method of investing wherein you buy shares of stocks or units of funds regularly over a period of time. You can place funds or buy shares every month or twice a month or every time you have money. It’s up to you WHEN, as long as you invest regularly and periodically until your target time or until your investment goal has reached its target period. How to invest using Peso Cost Averaging? Your target time – how long do you want to keep your funds invested? The longer the time, the better. How will you make money using PCA? It is very important to invest with the right companies to receive great returns or profit. If you are investing in Mutual Funds, choose the best mutual fund companies because they have already proven great track records. If you’re investing in the stock market, choose the giant companies that you are sure would be here for another 50 years or so. These big companies have excellent growth stocks track records. Because you invest regularly, you are adding and putting up more shares or units of investments in your funds whether the market is up or down. You are also minimizing risks by maximizing your earnings and letting them grow over time. I’m sharing here how PCA works relating to stock investments. In the sample below, assuming I decided to use around P5000 to buy stocks every 30 days. Notice that whether price of stocks is high or low, I still gain profit in the end. If you are currently investing in stocks, you can use and download this Excel Format I got from Fitz Villafuerte, so you can easily compute your earnings every month. Another sample here is taken from my UITF Equity Fund which shows gains every placement of units I bought. Sample below is an investment of 2000 every month. This was a real screenshot from my BDO investment. Peso Cost Averaging is a very reliable and safer method of investing because you will earn money in the long run. The main strategy is to invest with well-established companies with excellent performance and stable income status. Do it regularly for long term. Lump Sum Investing vs Peso Cost Averaging Method: Which is better? What is the procedure for PCA? Hi Fehl. We do know that for every buy transaction, there is a fee being charge. Would you say that it is more efficient to buy once or twice a year rather every month when it comes to PCA strategy? When we invest, we don’t focus on the fees because they won’t matter much. It won’t be PCA anymore if we invest once or twice a year. It’s another strategy. I just started reading your page this week, and I’m planning to invest in stock market once I get a good/enough overview of how it works. Just a question on PCA, should it be exactly periodic? What if I fund my account every 30th of the month but I will not immediately buy shares since I noticed that the stock is currently on a downtrend so I wait for a day or a week before buying to maximise the number of shares I can buy, is that OK? Hi, Allan. Yes, you can do it every 30th. It’s up to you WHEN. You can also buy more shares whenever the stock market is on a down trend. Cheers! hi ms fehl, tanong k lng, ung last trade price ba gagamiting value para sa stock certificate shares? ex: i hav 384 shares at ung last trade price ay 970.00….so 384 x 970.00..tama po b? Hi Ms. Fhel, Good day! Kakaopen ko lang po ng account sa COL and I’m planning to try PCA strategy. Ask ko lang po, Yung PCA Strategy at Mutual Fund po ba ay magkaiba? Or same type of investment lang sila,.medyo nalilito po kasi ako sa dalawa. Hi Fehl. I Love you! Hi, I just saw this post right now out of curiosity of investing money thru Stock exchange. Is there a way I could reach you personally to ask a few questions? like an email, facebook, or any social media account? The discussions in PCA is very interesting and I am very eager to know more about PCA. In PCA you must contribute same amount regularly over time, what if I still contribute but not same amount regularly let say Php 4000 and on the following month Php 2000 and so on and so forth. What will happen to my PCA is their any disadvantage or advantage on that? I have 200K in my savings bank na gusto ko i-invest. meron na rin akong emergency fund. I am planning to invest in both UITF and MF ( 100 K each). I can still invest additional 10Kfor each every month from my salary after investing this 200K. Ang tanong ko lang po in reference to this peso cost averaging. Hingi lang po ako ng advice. ano po ang mas maganda? i-invest ko po ba yung both 100 K in one-shot (lump sum) then do peso cost averaging later? or should I first invest like 20 K each (UITF and MF) then monthly invest of 10K each for peso cost averaging? ano po mas maganda sa tingin niyo? (PWD) kasi ako, wala akong work , gusto ko lang sana mag invest dun ,, yung EIP nila na 5k , kailangan ba dun lagi monthly 5k ? or kahit mababa basta tuloy tuloy naman ako monthly mag dadagdag ? Hi, COL Financial is accredited by the Phil. Stock Exchange so legit sya. Regarding you question about EIP, yes pwedi ka bumili ng stocks below 5K. 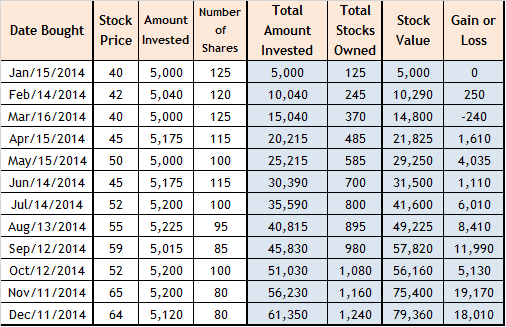 Some stocks are cheaper like ALI, BDO and JFC so if monthly for example you can buy 10 shares of ALI every month. Right now it’s 38.5 so 3850 ang cost non. Yung BDO naman you can buy 10 stocks around 109.50/share right now. First time reader po aq ng blog nyo and it’s very helpful po. Im an ofw here in Oman, and planning to invest in stock market using PCA method. I would like to ask the following po pra malinawan aq, ehehe..and hope you can answer me po. 1. s PCA method po ba meron po bang dividend n mkukuha? 2. for example po, I plan to invest in PCA for 5 yrs, and after 5yrs i want to get all the money I invested, panu po yun mkukuha?and ksama narin po ba dun ang interest ng na-invest q? Thank you ver y much po, I will wait for your reply po. Thank you again. And God bless. Sana marami ka pang mtulungan s mga advise mu. Hi, Aileen 🙂 1. PCA method is just a method/strategy of investing. The dividends you will get will be based from your chosen stocks. Your website is very informative , I keep on reading it. By the way , your above sample computation of gain/loss does not include commission,fees, etc. I have excel table format for peso cost averaging computation pattern with COL financial, you need to input only the prices and share you want to buy and it will gave you the gain/loss, % and average cost which includes all fees, etc. Kung gusto mo bigyan kita ng kopya para sa dagdag na info. ng mga followers mo. Hi po, can I get a copy of your PCA excel format? I’ve been looking everywhere ung included na other fees.. Thank you po in advance! Isa po akong OFW at minsan ay nag freelance din, masasabi ko pong meron akong medyo malaking halaga na naitatatago sa aking bank account. Medyo natutulog po kasi ito at nais kong gamitin at mapalago, isa sa pag iinvest ang nakita kong solusyon, at sa pag browse ko sa net ay napadpad ako dito sa blog mong ito. With regards to PCA – possible po bang isang bagsakan lang ang iinvest (long term) sa isang company kaysa monthly? or ideally lang po sya sa monthly basis investment. Marami na akong nabasa patungkol dito sa blog mo, medyo clear naman na sya at sa palagay ko mas lalalim pa ang nalalaman ko pag inapply ko na ito hands on. Nakakatakot lang din naman talagan mag risk, per yun ang first step. Advise naman po, how to start. Maraming salamat po at God bless you. Hi. Thank you for visiting. PCA method is a periodic scheme of putting up investment. If it’s a one time placement, it’s another thing although it can also work in the long run if you have chosen a nice blue chip company to invest your money with. isa lng po ako nangangarap matuto at maginvest sa Stock Market..Kasalukuyan po akong ngtatrabaho sa isang State U at member po ako ng retirement fund, Inc.,.kasalukuyan may personal share po ako na 500php/ mo at 200php (fix share ng university) total of 700php/mo., . at balak kong gawin itong 2k (ito lng po ang kaya ko) next month, ang tanong ko po ay, ano po ba ang mas malaki ang profit after 5-10 years, itong retirement fund, Inc. na ito or ung Peso Cost Averaging (PCA) ? salamat po ng maraming marami..
Any thoughts on Value Averaging? They will be automatically computed and updated, no need to use spreadsheets. I’m interested in investing in stocks, meron lang po akong mga tanong. 1. What will happen to my stocks in COL if the company I invested into will close? 2. What will happen if the online broker (ex. COL financial) will stop operating it’s services in the future because I’m planning on investing long tern (10-20 years). 3. Is there a dormancy period, for example I will invest one time for 100k on different companies and I will leave it without checking for 5-10 years, will my stocks still gain for that period without checking? Hi. If the company would close, the stocks will likely be delisted on the Exchange. 2. If that would happen, I think bigger broker company would already be acquiring our services. We are protected by the PSE no worries. 3. I’m not an expert broker but I don’t think your account will be dormant like that of a bank account as stocks are very active and they always change in value every second therefore, no dormancy on your account. The dormancy rule applies only when you withdraw proceeds from sales of stocks. 3 day period is required for that matter. ano po mangyayari sa stocks mo pag delisted na ang company sa exchange? ibig sabhin po ba hindi mo na makukuha ang perang in invest mo? . Hi Fhel, Great article so many things to learn here. but one thing I noticed, I cannot download the excel file you’ve posted it seems corrupted or something. It brings me to another page. Hope you can upload it again. Thanks for this opportunity and Godbless. I’m newbie in stock market industry, i have a question regarding the money i put up in mutual fund, i was assessed #4 in risk rating. i am supposed to buy PHIL EQUITY FUND, i was confused if i accept the waiver so i just chose PHIL EQUITY PESO BOND FUND instead. i really want to put my money on EQUITY FUND. can i still change the fund type which is equity fund? how? if it is not possible already, what is the possibility of earnings in BOND FUND? i really appreciate for the answers of my queries. Thank you. Hi Ms. Fehl. Your blogs are inspiring. Like most of your readers, im new to investing. im in my late 20’s and recently started funding for my retirement. also tried uitf for a month now. Id like to seek your good advice whether to go for MF or directly invest to stocks using the PCA method. Your response would be very much appreciated. thanks and More power! Aside from MFs and UITFs I would recommend Life Insurance Products that can also provide the same earning potential but can secure your family’s interest in case of death or total permanent disability. Hi. i am interested with PCA. Is this something i need to enroll once i get my online account. Or a habit/style that i need to practice when already go live buying stocks? As a beginner in investing, one of the main problems that has been nagging me since the beginning, is how taxes are done in stocks. I mean, if you gained money from dividends/selling of stocks from the company that you bought, isn’t that equivalent to income? and should it also be declared when filing taxes? if not, when should it be declared? I really would like to earn a lot of money from the methods that you’re teaching, yet I do not want it to go to waste because I accidentally evaded taxes. Hoping to get a reply from you soon. First, Ask ko lang po ung time interval ng peso cost averaging kung suitable ba for a daily or weekly basis? or is it for long term lang like monthly or semi-annual. 2nd ay ung price ng stock na bibilhin, related po ba ito sa price na binili mo previously? I mean, kelangan bang may minimum price difference ung bibilhin mo compared sa previous price? Kasi, nagtry akong i-exaggerate ung price to be the same in one year and using the excel format downloaded above, at ang lumalabas na gain ay negative, which is due to the charges/fees from Brokers. So, baka kako may kelangang price difference palagi sa binibiling stock, either mataas or mababa from previous. Please advise po. Hi, may tanong po ako regarding sa fees. Diba kpag po kasi bumili kayo ng maliit lang ang share lumalaki ang ave. price. kung 100share ng 83php na CEB = 8324.49php ang total. magiging 83.24485 ang ave. price nyo for that. So with that, COL po stock broker ko, eh since di naman daw po fixed amount and percentage ang gamit dito,, mas maganda po ba if kunwari quarterly mag invest instead of 5k for 1 month. Mas maganda po ba if 15k for 3 months/quarterly or 5k per month? Or ask ko na rin po kung pwede rin every 2 months. And paano po if kunwari ang pipiliin mo is yung quarterly or every two months, paano po pag mababa na this month yung mga stocks then baka mataas na next month, syempre matetempt po kayo bumili non. Paano po kaya yun? And regarding that po, nabasa ko nga rin po na magaaverage out naman din po so no need to worry kung what price ka bumili ng stocks. Please reply po. Thanks. Hindi?Can you average your losses? I’m a avid reader of your blog. I’ve already started buying stocks last january 2015 and I’m still a newbie in this kind of investment. I just want to ask if I can still earn if I only invest 2.5k per/mo. with some of the giant company like BDO using PCA? is’t ok to invest first on giant companies rather than the smaller one given that smaller companies gives you more share than the other. Thank you! HI Fehl, I love reading your article and I learned a lot from them. Question, using PCA, I am planning to invest approximately 50% of my monthly income (50% goes to family support) in directly stock market . Am I safe to assume not saving some percentage of my income (say 10% for emergency needs) is fine since I can withdraw invested money anytime I can or pull out some of it once I need. As per your article, if I have ever encountered unfortunate time and loss money, it wont be all money I invested, i mean only a portion of it so I can still have money anytime for emergency. As per your advise, better to put money on investment than putting them sleeping in savings account. Thank you and I know I’ll get valuable ideas from you. Hi Reo. It’s up to you but I still suggest you do that only if you already have stable work income, business income, life insurance. Thank you Ms. Fehl.. you’re a blessing to new investors like me.. more power! Hi Fehl, your website was so helpful. anyway, im going on vacation this april in the philippines and i wanted to invest my hard earned money abroad. could you please tell me which one is better to invest. UITF or this Peso Cost Averaging. or are theyone and the same? I hope you could give me further explanation because as of now I am thinking if i invest it in Mutual Fund or UITF or PCA. Hi ms. Fehl, i’ve been reading your posts for two weeks now.. and i can say i’m already addicted to reading atleast two to three post per night because i want to equip myself with knowledge about investing in MF, UITF and stocks before ako sumugod.. although im already in my 30s pero better late than never.. i have some questions though.. pag pasensyahan nyo na po ang mga tanong kasi ngaun lang po tlga ako nag aaral sa pag invest..
1) do you earn dividends sa MF po? 2) my officemate is using Col Financial and she told me she buy stocks from blue chip companies whenever she has extra budget and hndi po nya kinukuha yung money.. she wants to put it in stocks for a long period of time.. for her retirement i think- what are your thoughts on this po.. ok po ba ang gnitong strategy? I want to copy paste her style since im a newbie..
Ms. Fehl thank u for your posts.. hndi nyo po alam kung paano kayo nkakatulong sa mga kagaya namen na gusto rin mag invest pero walang knowledge tungkol dito.. THANK YOU! MORE POWER..
Hi. Thanks for always visiting. You’re always welcome here. 1. When you invest in a Mutual Fund company, you buy shares and that makes you a shareholder of that MF company and you can earn dividends when the company issue them. I just subscribed to your posts, at lalo lumakas loob ko mag-invest. Thanks to you! I am planning to register sa COL,. Plan ko sana gawin tong PCA na strategy pero medyo magulo pa. May tanong po pala ako, if I would be using PCA, may limit ba on how long should I hold my money? & may profit ba ko dito every month? Thanks po ! Hi, PCA works best if you invest regularly for long term but it’s always up to you when you stop. Have a plan and stick to it. Your investment would grow every month as you build them but they can also lose because the stock market is not always on the rise. There are ups and down. That is why you must choose the best companies and you must invest for long term. hi there.. i got confuse with the figures in pca. ibg sabihin ba ung gain/loss eh yun yung naging output nung hulog mo na 5k a month if so, it means in 60k a year kumita sya ng 75385 ( total sum of gain/loss) tama po ba or mali ako? Your blogs have been very helpful to me. I decided to give paper assets a try and I been seeing and reading your blogs because they always show up on my searches. My question is what is your opinion about Mark Minervini’s SEPA method? Do you think it’s applicable to the PH stock market? I’ve answered this question from you on my new post 🙂 Yes, you can also apply SEPA concepts and strategies to PSE stocks but not the tool they use since it’s only for US listed stocks. Cheers! God bless you too! Ask ko lng po kng paano mag apply sa mutual fund ..Interested voice ako I’m here OFW po ako.. Choose a reputable Mutual Fund company and go there and apply for a mutual fund. You will have to answer questionnaire and have assessment and discuss the funds suitable for you and the risks involved. Then sign your papers, fund your MF and follow your goal. I believe local banks in the Philippines have their own investment arms. You can access everything over the internet kahit wala ka sa Pinas. Try inquiring sa pinakamalapit na sangay ng banko sa area mo sir. I have a question with regards to PCA method. Let’s say for example my monthly regular budget for stocks that I can set aside regularly for now is only P5,000. – I’ll wait for next month and add the remaining 2,000 to 5,000 = 7,000 Php. I can now buy more shares on Company ABC. In this example, I’ll be able to buy 200 shares with an assuming P 32 / share and a board lot of 100.
:: I now have 300 shares after 2 months on Company ABC. :: With option B, I was able to buy 100 shares for Company ABC and 20 shares for Company XYZ on the same month. Hi Jeff. Thank you for being a regular reader here. 🙂 With questions here, I can suggest have a fix budget and invest slowly and do that faithfully. Since you only have P5000 budget, involved yourself to 3 stocks and buy monthly as much as possible. If 5k is not enough, divide it and buy 2 stocks, then next month, the other stock. Do it alternately as long as you are buying on those 3 periodically. Of course you can make them all sabay in a month if you add more funds to your budget maybe make it 9K so all your 3 picks will be all accounted for 🙂 PCA will be successful only if done long term and periodic investing. Cheers! Happy investing! Ms. Fhel., good evening.. gsto ko po sana magpaturo how to invest. Im really interested about it. I wanna learn about PCA ms. Fhel. Hi Abby. Thank you for visiting my post. We posted the guides here by going to the STOCKS tab above. Happy Holidays! How to do PCA on stock market? Do you invest on the same company multiple times like buying their shares every month? Yes, PCA is investing periodically to your chosen companies over a long time. Hi! I recommend you start either Mutual Funds or UITF. Choose which fund do you wish to open according to your risk appetite since you know your goal already. Majority of banks and MF companies will let you monitor your investments online so no problem. So it is not recommended to redeem interest earned while continuing PCA? Hi Ms. Marifel, if you are using peso cost averaging and let’s say the fund is performing well, will partially redeeming the interest earned multiple times affect the remaining balance’s ability to earn in the future? Hi Vance. It depends upon the investment feature. Some companies let manual or automatic scheduling and funding of investments. On banks, they usually require ADA so it’s automatic. All you have to do is make sure you have enough funds available where they will debit you. On stocks, you can either make manual or automatic schedule following your PCA strategy. can you recommend me an accredited stock broker for me?